^ a b King, Martin; Holloran, Peter; Luker, Ralph; Russell, Penny (2005). Carson, Clayborne (ed.). The Papers of Martin Luther King Jr: Threshold of a new decade, January 1959-December 1960. University of California Press. p. 227. ISBN 0520242394. Archived from the original on May 15, 2015. ^ "Leaders of the civil rights movement". CBS News. October 16, 2017. Retrieved April 4, 2018. 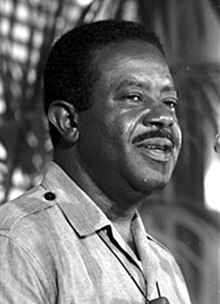 ^ "Ralph Abernathy Biography - life, family, children, mother, son, book, information, born, college, time". www.notablebiographies.com. Retrieved April 3, 2018. ^ "Ralph David Abernathy, Rights Pioneer, Is Dead at 64". Retrieved April 3, 2018.